Hurricane Harvey dealt a heavy blow to Rockport Fulton. Fortunately our boats were spared and we are up and running. Please join us for an amazing day of on the water photography, and birding/nature watching. Jeff Sims has a cottage for rent $120.00 per night. 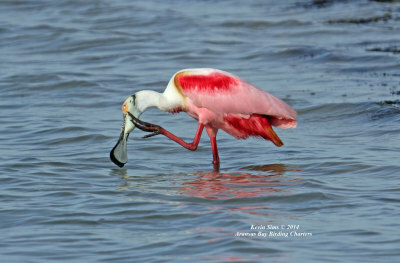 Aransas Bay Adventures is Rockport Fulton's only true on the water photography tour. We started taking photography tours in 2003. Captain Kevin is a photographer and shoots with a Nikon D7200 with a Tamron 150-600 lens. Captain Lori has recently begun shooting with a Canon 60D with a Sigma 150-500 lens. Our knowledge of photography helps us to put you in the right spot at the right times. We are also knowledgeable about your gear and how to hold it, pass it from person to person and store it so it is best protected. Our Photography tours leave the dock a half hour before sunrise, giving you a short 15 minute run to where the Whooping Cranes reside. By leaving this early we are on site when the sun rises. We will have about 15 minutes to get everyone and their gear set up - then if the Sun and Clouds cooperate you will be treated to a magnificent sunrise. After getting a few sunrise shots we will be in position as the Cranes wake up and begin to forage. By being on site at sunrise you will have the most time with the best light. 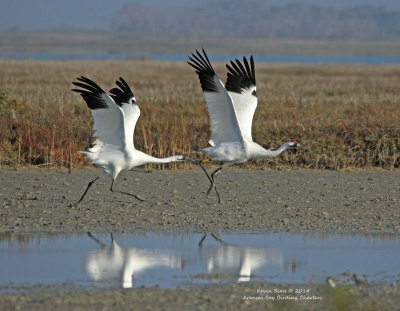 We hope to capture images of the Whooping Cranes in the magical light that happens just after dawn. Our tours are designed to fit your needs, so we are on your schedule not you on ours - we will stay with each subject as long as you like, then cruise along at a slow pace to find the next picturesque opportunity, stopping the boat for any shot you desire. 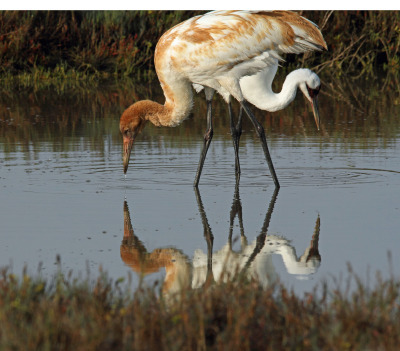 On our Whooping Crane photography tours you will have the opportunity to photograph many other species of birds as well as other wildlife. Photography tours take a minimum of four hours - we will stay as long as you like. Most people have had enough and are ready to come in at the six hour mark. 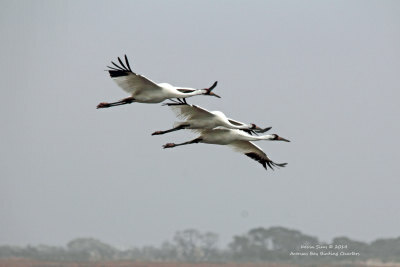 At some point the light will become harsh and the Whooping Cranes fly inland to feed and for fresh water. We do offer afternoon tours - these are more of a Sunset and Silhouette shoot for those photographers who appreciate a different venue, as the boat will have to face west into the sun to photograph the area where the Whooping Cranes reside. Our boats the Jack Flash and the Lady Lori are custom designed for photography. Each boat has an enclosed cabin to protect you and your gear from the elements. There is plenty of room in each boat for tripods and camera cases, feel free to bring those tripods and long lenses. Many people wish to set up a tripod and then have a hand held rig for flight shots. Each boat has an upper and lower deck. 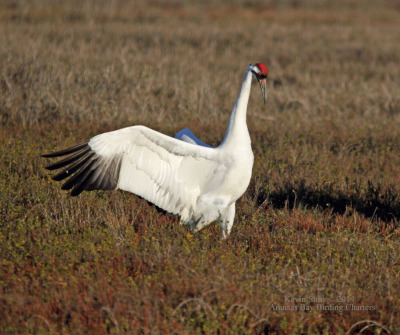 The upper decks are excellent for shooting above the grass and brush to photograph the Whooping Cranes as they feed on Blue Crabs, Wolfberries and the occasional snake. The lower decks are the place to be if you wish to have a more eye level perspective. Some people like to lie down on the lower decks to photograph the Whooping Cranes as well as the many other birds we encounter on each tour. The Jack Flash can accommodate three tripods each on its upper and lower deck. The Jack Flash has a third lower rear deck that is sometime used, if conditions are right, for an even lower perspective. The Jack Flash has a draft of only six inches. This means we can get you in close and to areas not accessible to other tour boats. The flat bottom makes for as stable a platform as possible. We like to position the boat so it is resting in the mud or on the shore so that there is very little movement. The Lady Lori can accommodate two tripods on her upper deck and four tripods on her lower deck. The Lady Lori's rear deck is the same level as the lower deck. There is room for a couple of hand held photographers on this deck. The rear deck is used mostly for Dolphin Photography. The Lady Lori has a draft of 18 inches, still much shallower than any other tour boat in the area. She will also rest in the mud and on the shore to provide a stable platform for photography. There are larger group boats in the area that offer excellent birding opportunities. They do all they can to accommodate photographers. Just realize they are large boats and limited to areas they can go. You will also be on their schedule. They have programmed tours leaving the dock once or twice a day. These tours leave at a specific time and return at a set time. Don't be fooled by some of the advertisements for photography tours. There are a few fishing guides in the area that try to pick up extra money in the winter by saying they are a photography guide. Their boats are open, fiberglass hull boats. They are great for fishing but much too unstable for photography. Your gear will be exposed to the elements in an open boat as well as having no protection from the sun, rain or cold for yourself. At Aransas Bay Adventures we strive to provide you with the best photographic experience in our area, on boats designed for you, the photographer. 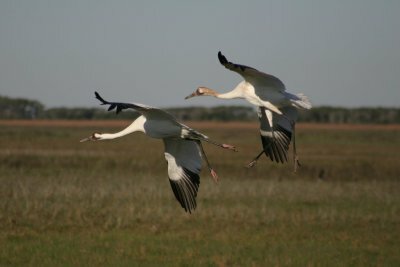 Each tour is unique, as you never know what wildlife will spring forth or which bird will pose to have their picture taken on the Aransas National Wildlife Refuge, or in the surrounding waters and islands of the Texas Inland Coast. A birding trip to Rockport would not be complete without a trip to Austin Street. Visit the Studios of Diane Loyd, Salt Flats Photography,www.saltflatsphotography.com Diane is an amazing photographer and accomplished scuba diver with fantastic images taken on land as well as under the water. Diane and her mother, Dovie, co own the shop, For The Birds. 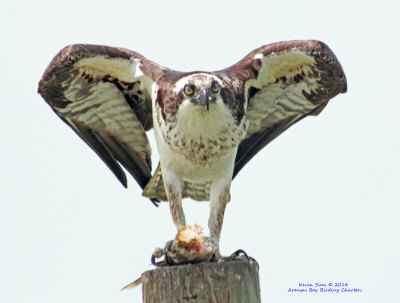 For the Birds is Rockport's best source for all your birding information. Stop by John Martell's studio at 302 Austin street. John is a local award winning photographer. If you are interested in adding to photography skills John also holds workshops to help you get the most from your camera gear. www.johnmartellphotography.com . Be sure to stop by Ruben Aiken's Sazon at 114 Austin Street. www.sazonandthewhoopingcranes.com Ruben offers one of a kind jewelry he hand crafts himself. Ruben is a Whooping Crane enthusiast , or as we local Whooping Crane lovers are called, a Craniac. Be sure to check out Goose Island state park. www.tpwd.state.tx.us/state-parks/goose-island Take one of the bird walks. You may get to see a Painted Punting. A short drive and Ferry ride will take you to Port Aransas. The birding center there will provide you with some amazing birding opportunities. 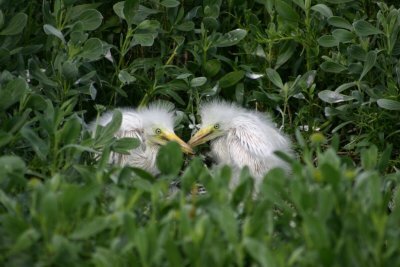 Check them out at www.portaransas.org/play/birding . 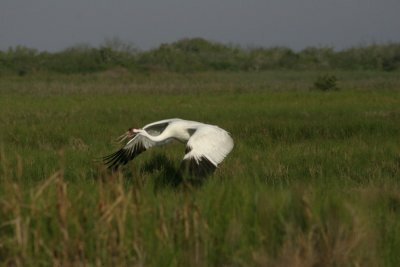 A thirty minute drive north of Rockport on Highway 35 will take you to the Aransas Wildlife Refuge. They can be found at www.fws.gov/refuge/Aransas You will see all kinds of wildlife on a tour of the refuge. Everything from Alligators to Whooping Cranes. Thank You for visiting BirdRockport.com. Please check back with us for any of your birding needs.